Mary Dormer Harris, the local historian, thought that the elephant had a religious meaning. Animals were often treated as religious symbols and the elephant is seen, not only as a beast so strong that he can carry a tower - Coventry's castle - full of armed men, but also as a symbol of Christ's redemption of the human race. The animal, according to one story, is supposed to sleep standing, leaning against a tree. Hunters sever the trunk, and he falls helpless to the ground, until a small elephant approaches and pulls him up with his trunk. This was seen in medieval times as the type of fall of Adam and Eve and of Christ's redemption of the human race. The elephant’s enemy was said to be the dragon and Coventry is also said by some to be the birthplace of St. George, who slew the dragon. 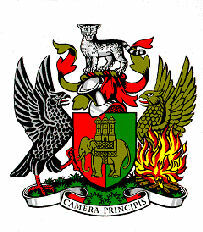 The older arms for the city also showed a tree – said to be Cofa’s Tree from which Coventry took its name, but that is no longer used. The Crest, a cat-a-mountain, or wild cat. It is generally said to be a symbol of watchfulness. The helmet is that of an esquire with the visor closed, as with all boroughs. The Shield is coloured red and green, the traditional colours of the city dating back to at least 1441. The device is a golden elephant and on its back a gold castle with three domed turrets. The Supporters, granted in 1959, are the Eagle of Leofric (husband of Lady Godiva) and the Phoenix. The Black Eagle of Leofric is a symbol for the ancient Coventry and the Phoenix arising from the flames represents the New Coventry reborn out of the ashes of the old. Camera Principis (the Prince's Chamber) is believed to refer to Edward, the Black Prince. The Manor of Cheylesmore at Coventry was once owned by his grandmother, Queen Isabella, and eventually passed to him.